Things we learned in the Army. Welcome to my web site! I hope this site is more about the 71st LRP Det than it is about me. I was a member of the 71st Long Range Patrol Detachment. And since there is no other site for the 71St, I suppose it has to start with me. Here you'll learn all about the 71ST Long Range Patrol Detachment. I hope to develope a history of this unit that I served in a long time ago. I hope this site can be a place for others who served with the 71St to come and visit, find links to old friends, share their stories and contribute to the unit history. Specifically, I served with the 71st Long Range Patrol Detachment. That's our unit sign as it appeared on our barracks at Camp Frenzel Jones. The 71st was attached to the 199th Light Infanty Brigade, "Redcatchers". 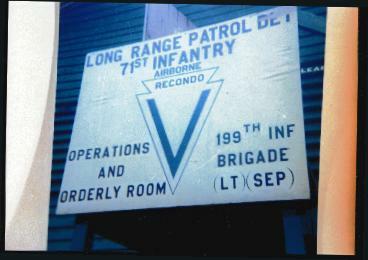 One day in 1969 the 71st became M Co 75th Rangers. All the LRRP units in Vietnam became Rangers overnight. I've visited many of these individual Ranger- LRRP sites on the web, and to be truthful I'm jealous of them all. And that is why I want to build this site for my unit, "The 71st LRRPs". So here goes, bear with me, I'm slow at this stuff, it will take some time to make it good. Check out the different pages, forgive the typing and spelling errors. Keep checking back, it's a work in progress. I'm interested in your comments and suggestions. Like I said, I want this to be "our" site, the men of the 71St LRP. Yes, Yes I know! M Co 75th Rangers too! All are welcome to comment and contribute. It really has been awhile since I did anyting with this site. I haven't lost interest so much as my life has changed. I find I don't have as much time as I use to have. It's been four years since my wife Evonne passed away. I thought it would never happen, but I have remarried. I met a wonderful woman at the Ft Benning Reunion in 2004, Lorraine Jones, "Houghton" now. We were married May 27th 2006. She's good to me and supports my efforts in the 75th Ranger Regiment Association. We attended the reunion at Branson last summer. Lorraine got to meet my old friend Dave Wolfenbarger when we got together again for the first time since I stepped onto the chopper out of Firebase Barbara. Some of you guys who have yet to make a reunion need to give it a try. Like this summer at Ft Benning. Hope to see you there. 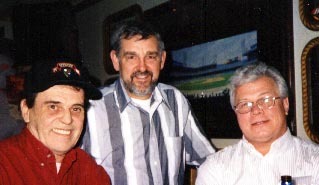 Feb 19, 1949 - Sept 16, 2002 "Rest in Peace Darling"
Taken at a mini Reunion in Ludington MI- A good time had by all! This was the back of our barracks. I'm standing in front of the door to the NCO's quarters. I use to have the men come in here to visit and party sometimes. Well this place is long gone, so you'll have to party and visit through this quest book. Please sign my GuestBook Web Gem so I can keep track of visitors. Come on in! 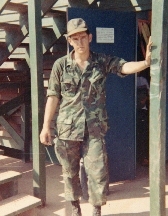 If you like my site...............give it a vote by clicking on the 100 Best Vietnam Veteran Website Icon above........and thanks!